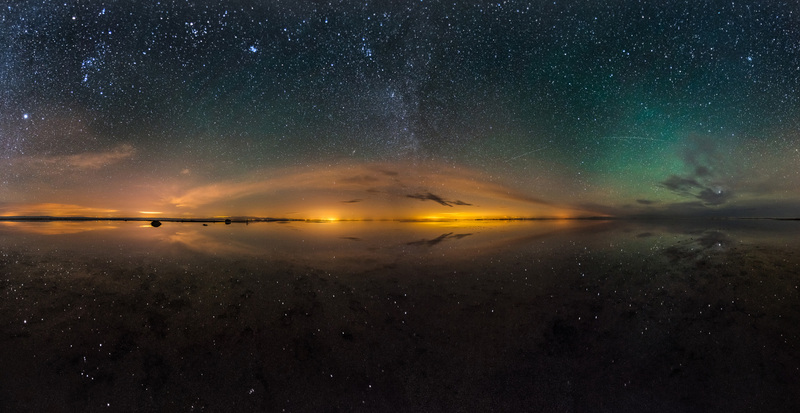 Panoramic view showing the sky over maranjab salt lake and winter Constellations and their reflections. This place is located near kashan, Iran. Salt lake or salt desert is actually a dry lake; it is located beside maranjab desert. In rare cases if there is a heavy rain or snow the water will stay on it’s dry surface for several days. I Walked far away alongside the lake, put my tripod on the ground and took this panoramic night photo.